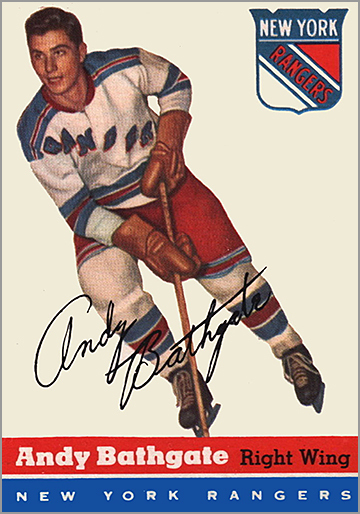 Andy Bathgate, the Hall of Fame forward known best for his years with the New York Rangers, passed away on Friday at the age of 83. 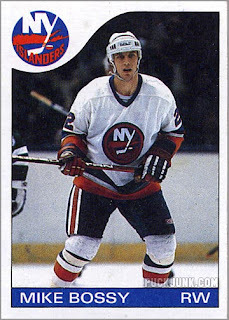 He spent 17 seasons in the NHL, scoring 973 points (349 G, 624 A) in 1.069 games. 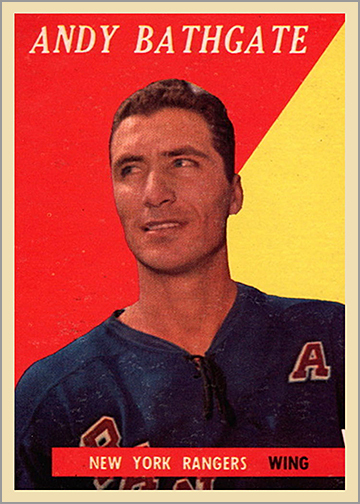 Bathgate was named to the NHL All-Star Team four times, won the Hart Trophy as league MVP and appeared in the annual NHL All-Star Game each year from 1957 to 1964. 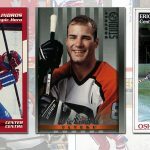 Here we take a look at Bathgate’s career, illustrated with some of his best hockey cards. 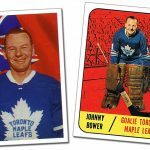 1950-51 & 1951-52 – Bathgate played two full seasons of junior hockey with the Guelph Biltmores of the Ontario Hockey Association, scoring 90 points his first season and 77 the next. His team won the Memorial Cup in 1952. 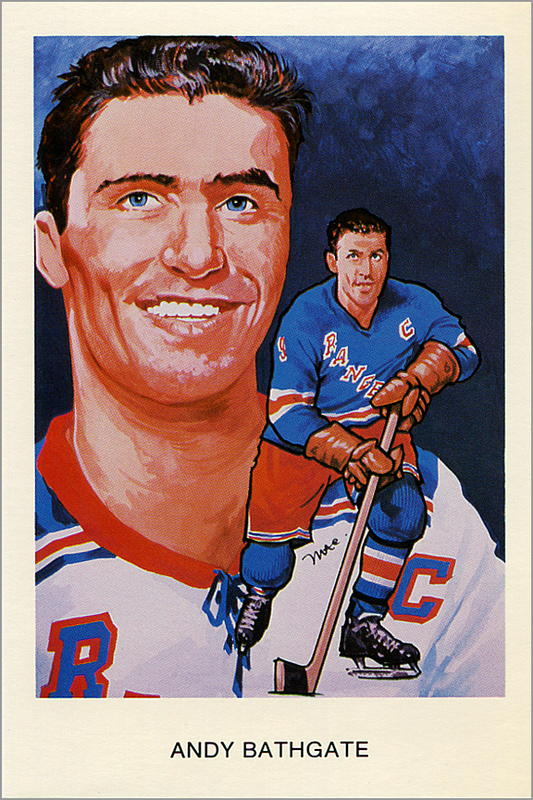 1952-53 – Bathgate broke in with the New York Rangers, appearing in 18 games, scoring just one assist. 1953-54 Parkhurst #56 – Bathgate’s second year in the NHL was another part-time affair. He played only 20 games with the Rangers, scoring two goals and two assists. 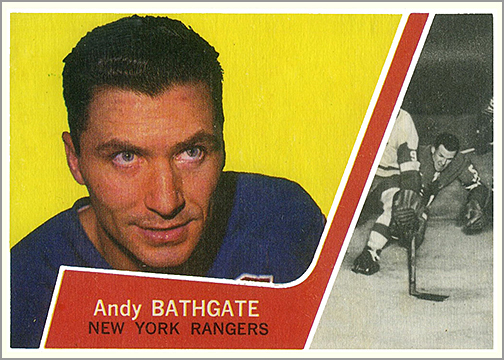 1954-55 Topps #11 – In his third NHL season, Bathgate finally cracked the Rangers’ lineup full-time, scoring 40 points (20 G, 20 A) in 70 games. 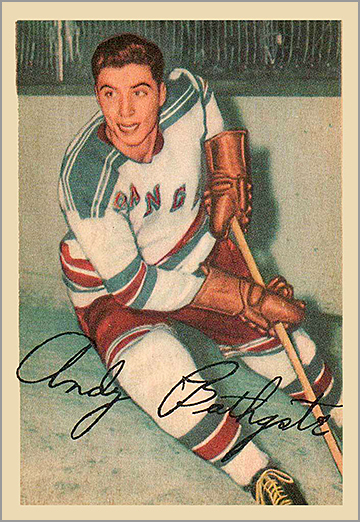 1955-56 – Despite having a decent ’54-55 season, Bathgate did not get a hockey card because Topps didn’t make any, while Parkhurst only made cards of Montreal, Toronto and Detroit players. 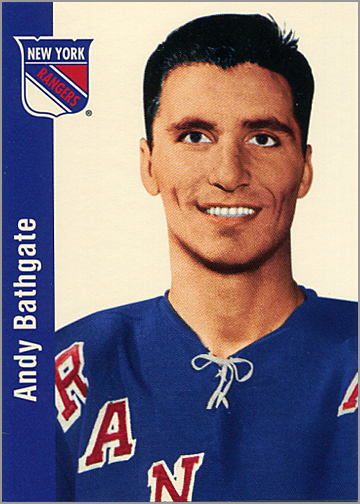 That year, Bathgate led the Rangers in scoring with 66 points in 70 games. 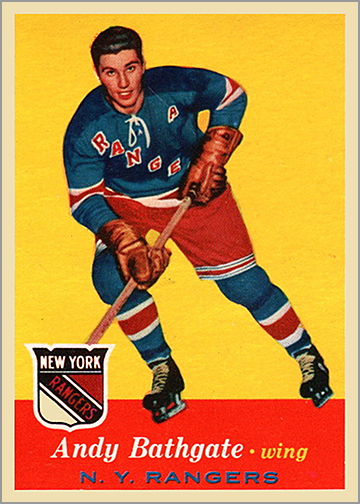 1956-57 Parkhurst Missing Link #90 – In this third full NHL season, Bathgate again led the Rangers in scoring and was a better than a point-per-game player with 77 points in 70 games. 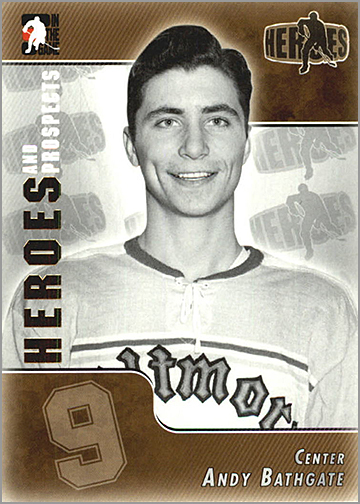 1957-58 Topps #60 – Bathgate hit the 30-goal plateau and added 48 helpers for 78 points in 65 games. He was named to the NHL Second All-Star Team. 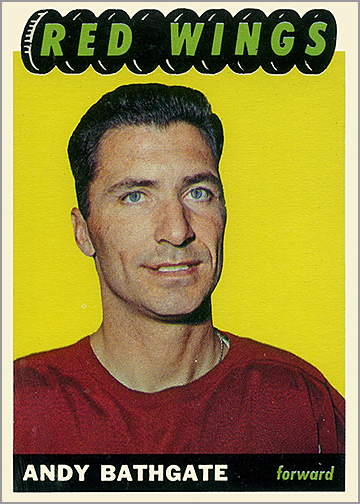 1958-59 Topps #21 – In his finest season, Bathgate scored 40 goals and 48 assists in 70 games with the Rangers. 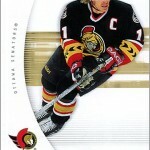 He won the Hart Memorial Trophy as the NHL’s most valuable player and was named to the NHL’s First All-Star Team. 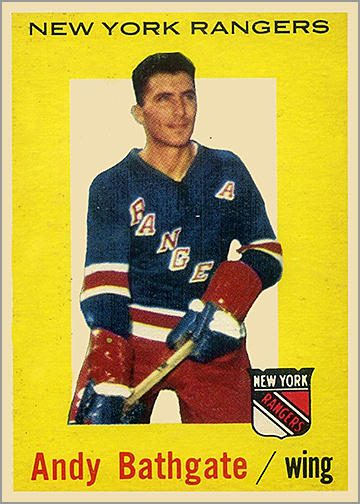 1959-60 Topps #34 – Bathgate led the Rangers in scoring for the fifth year in a row, netting 26 goals and 48 assists in 70 games. Perhaps his most notable contribution that year was when Bathgate unleashed a slap shot in a game against the Montreal Canadiens on November 1, 1959. The shot broke Habs’ goaltender Jacques Plante’s nose. When Plante returned to the game, he was wearing a goalie mask. After that, goalie masks increased in use in the NHL and eventually became commonplace. 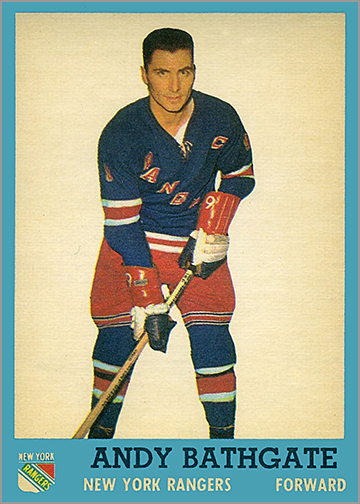 1960-61 Topps #45 – Yet again, Bathgate led the Rangers in scoring with 77 points (29 G, 48 A) in 70 games. 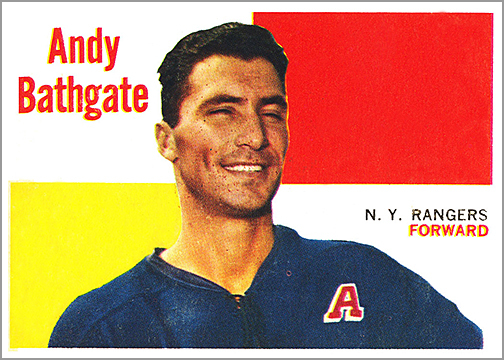 1961-62 Topps #53 – Bathgate was named the Rangers team captain. For the second time in his career, he broke the 80-point barrier when he scored 84 points (28 G, 56 A) in 70 games. Bobby Hull of the Chicago Blackhawks also scored 84 points, but won the scoring title since he had more goals. Bathgate was also named to the NHL First All-Star Team. Topps was cheap that year, and re-used the same photo of Bathgate that they did on his 1954-55 card. 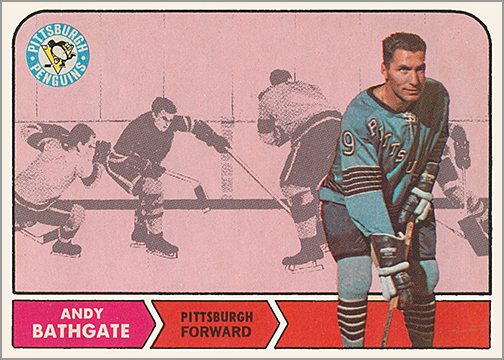 1962-63 Topps #52 – In his second season as captain, Bathgate’s card shows him sporting the “C” on his sweater. He led the Rangers in scoring for the eighth and final time in his career, putting up an impressive 35 goals and 46 helpers in 70 games. 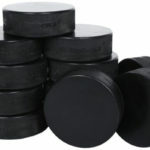 Bathgate was again selected to the NHL Second All-Star Team. 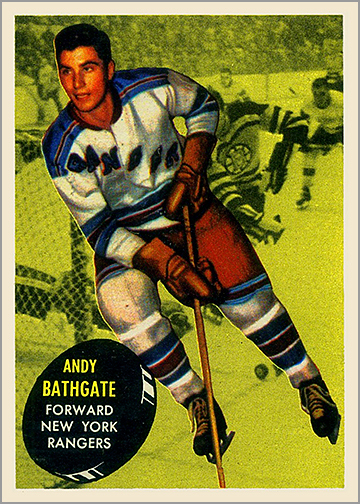 1963-64 Topps #52 – Bathgate was traded to the Toronto Maple Leafs in a seven-player trade late in the season. He had another great year, scoring 77 points in 71 total games between the Rangers and Leafs, and another nine points in the playoff en route to his first and only Stanley Cup Championship. 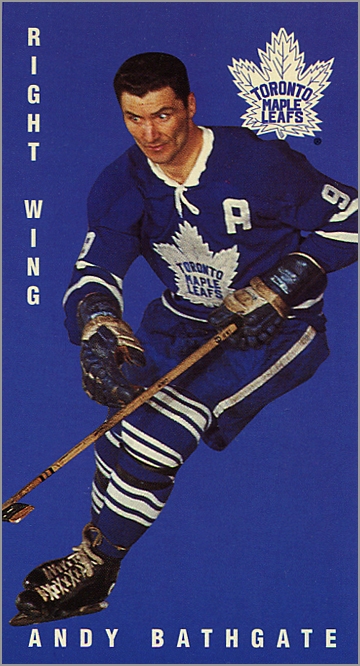 1964-65 Parkhurst Tall Boys #124 – In his only full season with Toronto, Bathgate scored 45 points in 55 games; good enough for fourth on the Leafs behind Frank Mahovlich, Dave Keon and Red Kelly. 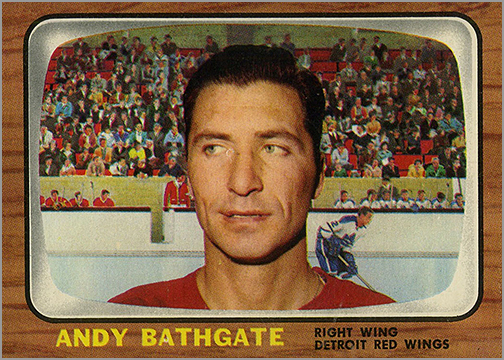 1965-66 Topps #48 – Bathgate was traded to the Detroit Red Wings between seasons. 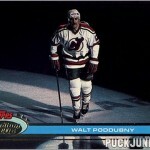 Topps responded in kind by hastily slapping some red paint over his Leaf’s jersey in this trading card photo. At this point, Bathgate’s career was winding down, though he did put up 47 points in 70 games with Detroit. 1966-67 Topps #44 – In his second — and last — year in Detroit, Bathgate scored 31 points in 60 games. He was also sent to the minors for the first time in over a decade. 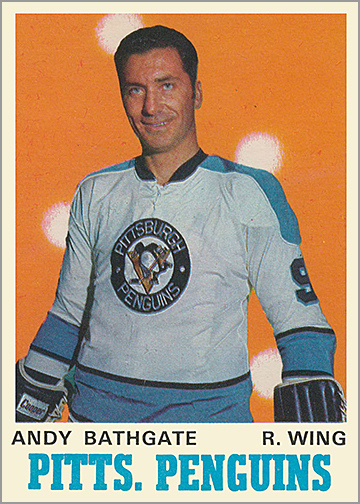 1967-68 – Bathgate was claimed by the Pittsburgh Penguins in the NHL Expansion Draft. He put up some good numbers too, leading the Penguins in scoring with 59 points (20 G, 39 A) in 74 games. No card was made of Bathgate that year. 1968-69 O-Pee-Chee #104 – Bathgate did not play in the NHL during the ’69-70 season. 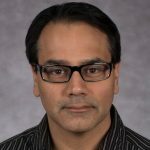 Instead, he played with the Vancouver Canucks, who then were a part of the Western Hockey League. 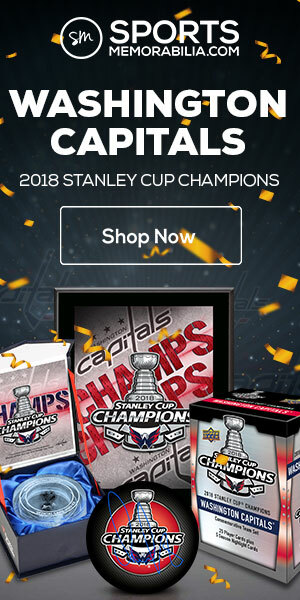 The Canucks won the league championship that year. 1969-70 – Bathgate spent another season with Vancouver of the WHL. Again, his team won the league championship, while Bathgate was named the league’s MVP. 1970-71 O-Pee-Chee #207 – Bathgate made it back to the NHL for one final season, again with the Penguins. His 44 points in 76 games put him at third for team scoring. 1971–72 – Bathgate was a player/coach for HC Ambri-Piotta in Switzerland. 1973-74 – Bathgate was the coach of the World Hockey Association’s Vancouver Blazers, compiling a 27-50-1 record and missing the playoffs. 1974-75 – Bathgate came out of retirement and played for the WHA’s Vancouver Blazers. In 11 games, he scored one goal and six assists. 1978 – Bathgate is elected to the Hockey Hall of Fame. 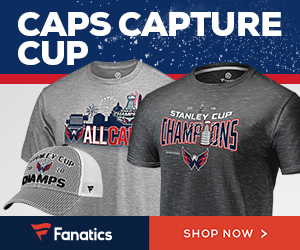 Blake’s Takes: Goals, Goals, Goals! Andy Bathgate.. We will miss him. RIP. Very nice story-telling with the cards.